One month from now, on Saturday, May 12, 2018 the 19th annual Justin Van Hollebeke Memorial Golf Tournament will be held at one of Puget Sound's top courses: The Golf Club at Newcastle. 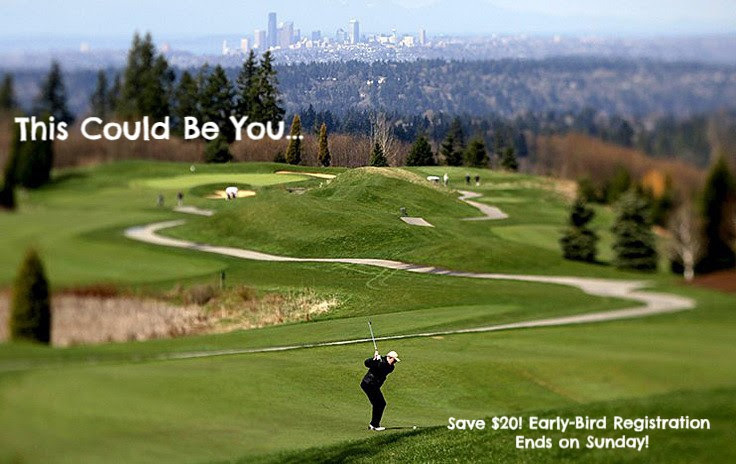 Experience world-class golf on the China Creek course while raising money for Wonderland Developmental Center! Registration includes green fees, cart, access to the practice range, Hole-in-One / Putting / Long Drive / Closest-to-the-Pin contests, Wonder Pack (mulligans, etc. ), adult beverages, and plated dinner. Want to support Wonderland but not quite ready to tee up for 18 holes? Let the sweeping views of the Seattle skyline and the chefs at Newcastle dazzle you with their salmon, sirloin, or vegetarian offerings. Dinner-only tickets are available for just $60.